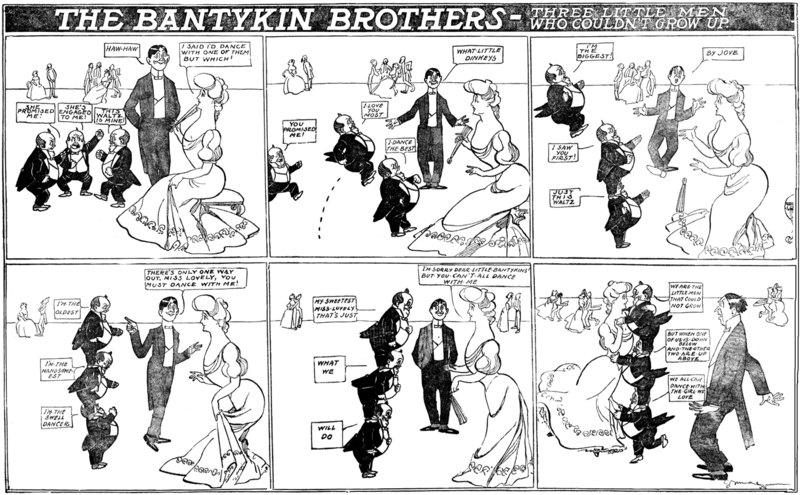 The Bantykin Brothers was a New York World series, but may not have appeared consistently in the World itself -- it could conceivably have been a filler mostly used by syndicate clients and other Pulitzer papers. I say this because Ken Barker's World index doesn't mention it, I only have a single example from the Rocky Mountain News, and Cole Johnson's examples (seen above) are all from the St. Louis Post-Dispatch. Fillers were sometimes distributed to newspapers when the home paper had an advertisement to run -- so the way to figure this mystery out is to check the World's Sunday sections for the known Bantykin Brothers dates -- 5/27/06, 6/10/06, 6/17/06, and 10/7/06. Alex Jay has determined that the Bantykins ran in the World at least sometimes, based on an ad in the Evening World on 10/26/1906. 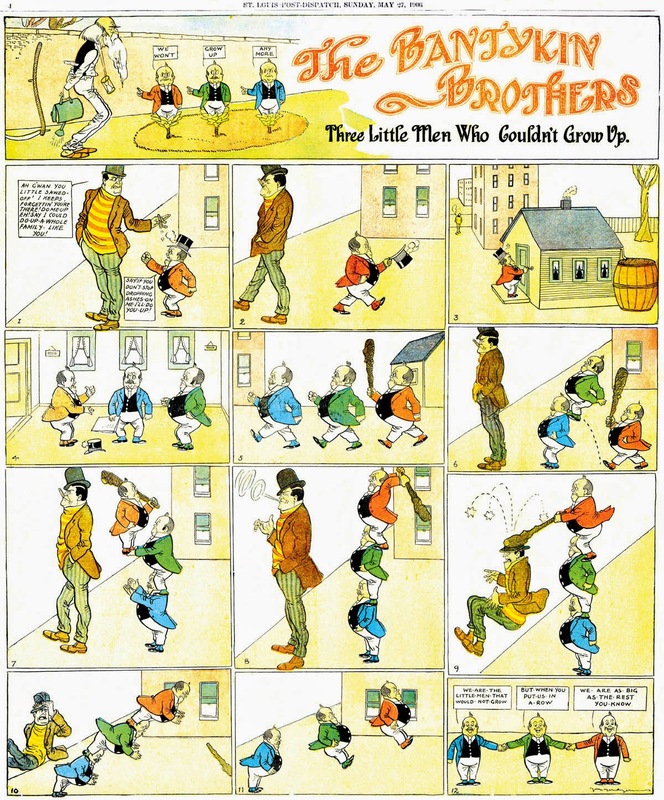 It is probable that Barker didn't list the series in his index because the signature on the Bantykin Brothers strips are illegible, and Barker organized his index by artist. The signatures on our samples give the vague impression of a first name initial G, then a last name starting with M. But it's really little more than a scrawl. Based purely on the signature, Gus Mager would seem a likely suspect. However, these strips are not particularly in his style, his signature was normally legible, and he was working for Hearst at the time, though admittedly mid-1906 was an oddly lax time in his work there. No, based on the art style, I lean more toward these being done by an undercover Carl "Bunny" Schultze. This doesn't make a heck of a lot of sense either, since he was also gainfully employed by Hearst, but to me some of the stylistic details sure look like his work. So ... other opinions? 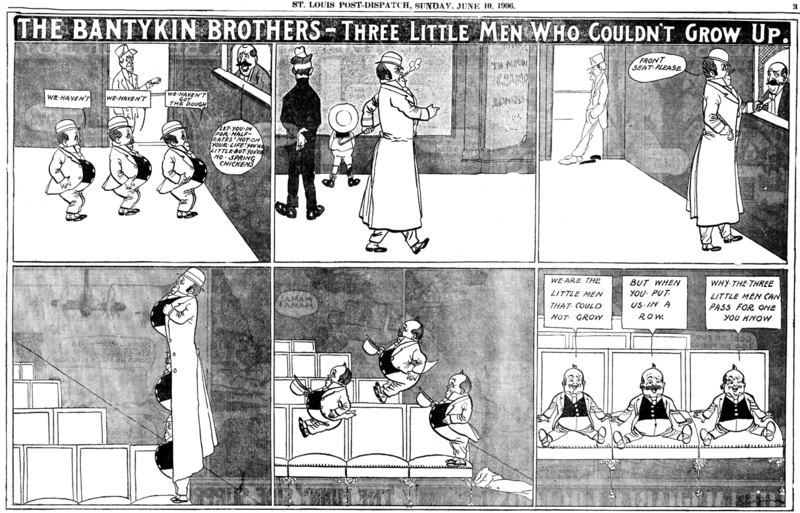 Anyway, all that bookkeeping business aside, these are pretty cute strips, though we've seen enough animated cartoons use variations on this gag later on that it doesn't have quite the punch it may have enjoyed in 1906. I suppose the funniest aspect of all is the description Cole Johnson used for the series when he sent me the samples -- "These guys are kind of like Leighton Budd's characters, only violent, cheap, and horny." Thanks to Cole Johnson for the samples and the punchline to this otherwise rather dry post! Could this possibly be the handiwork of Cornell Greening?